Originally created by Dropout Design, this revision adds a few extra features. You can build the boards from the schematic and open source firmware, or buy full kits from the Adafruit or Make Magazine online shops. 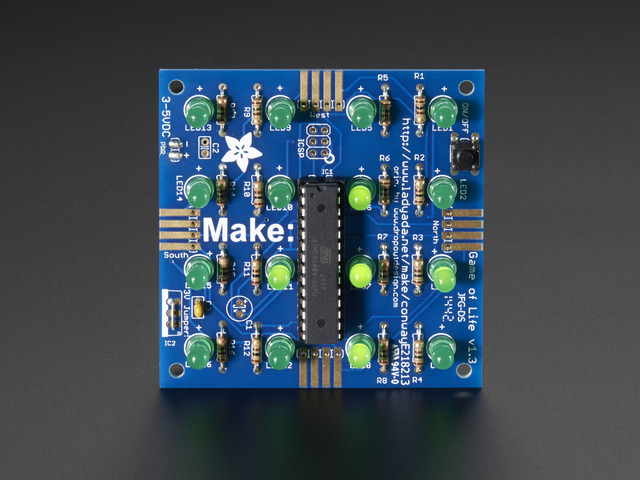 The kit is very easy to make and an excellent first electronics project. It is perfect for workshops since at the end everyone can connect their completed module together. Connect as many kits as youd like, in any configuration, to create a larger game board. Runs off of 2 AA batteries, but can be easily modified to run off of USB or wall-wart power. On/Off button to save power, also for resetting the display. Automatically resets if the colony has died or stagnated (regeneration). Backwards compatible with older versions. There are a few tools that are required for assembly. None of these tools are included. If you don't have them, now would be a good time to borrow or purchase them. They are very very handy whenever assembling/fixing/modifying electronic devices! I provide links to buy them, but of course, you should get them wherever is most convenient/inexpensive. Many of these parts are available in a place like Radio Shack or other (higher quality) DIY electronics stores. Click on the schematic for the higher-res image. If you're planning to make a really large array, or you want to make this kit work with the older Game-of-Life kits that had 9V battery inputs then here are extra parts you may need. 4-pin right angle male header. For easily connecting multiple kits together. The purchase links are for 'breakaway' 36-pin header, so just buy one and break off 4-pin pieces. 4-pin right angle female header. For easily connecting multiple kits. For reprogramming chip with new firmware. Open up the bag of parts and check that you have all the components. The Bill of Materials (parts list) page has a detailed list of everything you should have. Take the PCB and place it in a vise or other holder so that you can easily place and solder parts. Heat up your soldering iron to 700degF and wet the sponge. Clean the tip if necessary. Make sure you have all your tools! The first step is to solder in the resistors. The resistor is the tan-with-stripes things, they're probably on tape as that's how they come from the factory. Remove the tape and bend the resistors into staples as shown. The resistors are named R1 thru R16. Placing them on the PCB is easy, just look for the image on the PCB that matches the shape of the resistor. Resistors are non-polarized that means you can stick them in 'either way' and they'll work just fine. Do the same for the other wire. Put down the iron and pick up the diagonal cutters. Using the cutters, clip the wires of the resistor right above the joint. Repeat for all 16 resistors. I'll show soldering all of the resistors at once, but of course you can do as many or few at once as you'd like. Solder and clip all of the resistors. Next we're going to place the ceramic capacitor C3 and the wire jumper for IC2. This kit was designed to be backwards compatible with the Dropout Design version which had a 5V regulator and ran off of a 9V battery or wall supply. If you're planning to use this kit with the older version, make sure you use a 7805 in IC2. For these instructions I'm going to assume that you're not going to do that. For IC2 we're going to jumper the chip. Use a small piece of wire such as one cut from the resistors, bend it into a staple and thread it through the two outer pins of IC2. (See the image left). Make sure the wire doesnt touch the middle pad. Solder the jumper wire and the capacitor. Clip the extra wire off when done. Next we're going to solder in the socket. A chip socket is used to protect the chip and also lets you replace it if it gets damaged somehow. The socket has a little note in one end, make sure this matches with the little notch in the silkscreened PCB image. In the picture shown, the notch is on the left. The socket has short legs so it's more likely to slip than a resistor. The easiest way to solder the socket is to hold it against the PCB with one finger (or tape) then solder in two points on opposite sides. Once you've got it tacked, solder in the remaining pins. Next are the LEDs. 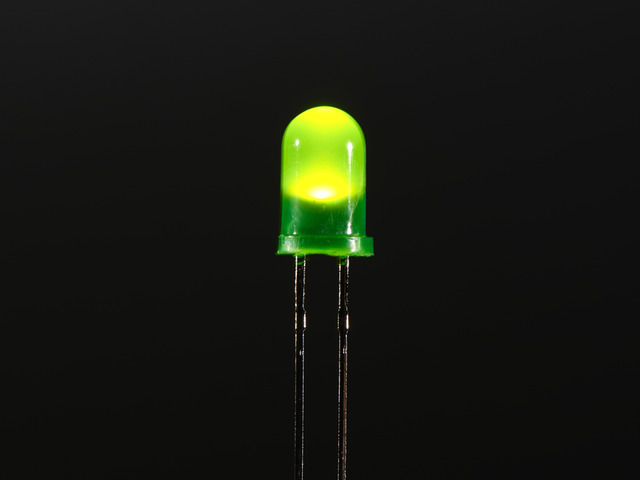 LEDs, unlike resistors, are polarized and must be placed correctly or they won't light up. One leg of the LED is slightly longer than the other. This is the positive (+) leg. If you look at the image on the PCB, you'll note that one side has a + next to it, this tells you how to orient the LED. Make sure the long lead goes in the hole marked +. Place the LED flat against the circuit board and bend the leads out. Solder both leads of the LED. Repeat for all 16 LEDs. Place the ON/OFF/Reset button. The button is non-polar. The button will snap in and should sit flat against the PCB. Solder in all four pins of the button. The leads are pretty short so you shouldn't have to clip them. Next it's time to insert the microcontroller that does all the hard work of calculating the game and displaying LEDs. Chips come from the factory with their legs angled out, so press against a flat table top so that the legs are straight and parallel. Then insert the chip into the socket. The chip must be placed correctly, make sure the notch at the end of the chip matches the notch in the silkscreen of the PCB. This should be the same as the notch in the socket. In case you placed the socket wrong, make sure the notch is at the same end that has the rectangular grid of 6 holes marked ICSP. Next we'll attach the battery back. I'll show how to shorten the wires which makes for a slightly neater appearance. It's completely not necessary though. To shorten the wires, clip them about 2" from the pack. You'll have to tin the ends if you clipped the wires. Heat up the wire and dab some solder, which should wick into the wire and keep the strands from flying out. Next, connect up the battery pack. The red wire of the pack goes to the hole marked with a +, the black wire goes to ground, marked with a -. Solder in the two wires. Time to test! Place two AA batteries (rechargables or alkalines) into the pack and watch the Game of Life start playing. If you press the ON/OFF button you should see a checkerboard pattern. Time to wrap it up. Remove one side of paper from the sticky foam, place it in the center of the battery holder. Then remove the other side. Stick the battery pack onto the back of the PCB, near the bottom. That way the weight of the batteries will act as a stand so that the kit can sit on your desk! There are tons of Game of Life kits out there but what is cool about this design is that you can plug together multiple boards to create a mega-display! Power and communications is passed from board to board, so the whole thing updates at once. If you are connecting to an older version (v1.2 or less) of the board, with a 7805, you will have to solder in a 7805 into your kit in location IC2. Otherwise the 9V DC power will fry your GoL module! For these instructions, I will assume you are only connecting v1.3 or higher (Adafruit design) kits together. If there's a button in your kit, then it's a v1.3 or higher kit. The modules must be connected in the correct orientation. Each module has 4 'ports' labelled North, South, East and West. To connect a module to another, make sure that East connects to West or North connects to South! Another way of saying it is, make use the large Make: logo is always the same direction. The easiest way to connect two modules together is to first line them up next to each other. Then bend a leftover small piece of wire into a staple. Thread it through the adjacent holes, then solder to make a connection to both boards. Then turn over and solder the other side too. This is a permanent connection, so make sure to use lots of solder on both sides to get a nice strong connection. You can also do it without wires, just put a blob of solder on both sides. Then drag the soldering iron between the two boards, and slowly lift it in the middle. With a little practice you can easily create a solder bridge. Don't forget to do the other side too! Another way to connect them is to use right-angle header to allow plug-and-play of the modules. One module has a female (receptacle) connector. The other has a male (plug) connector. Check the parts page for links on where to buy right angle header. If you use header, make sure it looks like the image below, if everyone sticks to this convention you'll be able to connect up to any other kit! If you have 5 or 6 GoL boards, you can make a funky cube. First, assemble 5 or 6 boards. Place the first board in a vise and start with the North port. Put plenty of solder on the first tab. Solder one of the excess wire bits onto it. Get the next board lined up. Make sure you are connecting it to the South port. Bend the wire down and solder it to the second board. Repeat for all 4 tabs. Test the two boards by touching the battery case to the + and - on one of the boards. The game should play on both boards. Connect a third board. The trick to knowing how to orient boards is that you can always connect North and East & South and West ports together. In this case we connect West and North of the new board to the existing structure. Test the cube after each new board to make sure you've got it on right. When you're done you can attach the battery pack pack and stick it onto the inside. This is a very short manual because the kit is very easy to use! This version of the GoL kit requires between 3 and 5V DC to run. That means you can't run it off of a 9V battery. You can, however, run it off of 2 batteries or a USB cable! Any kind of AA battery, rechargable or alkaline, is just fine. If the kit gets dim, just recharge your batteries. It should last for about 100 hours on one set of fresh batteries! If you turn the kit off when not in used, it will last even longer, of course. If you'd like to run the kit off a 9V-12V DC wall adapter or a 9V battery, you'll need to place a standard 7805 voltage regulator in location IC2 and remove the jumper wire. If you have multiple kits connected together, each one will need a 7805. See the parts list for where to buy a 7805. There's a little button on each kit which you can use to turn it on or off. This will save battery when the kit isn't in use. Simply press-and-hold the button for a few seconds. It should display a checkerboard pattern and then go out. The kit is now off. To turn it back on simply press the button (you don't have to hold it though) and it will start up again. If you want to reset the kit (because, say, it gets into a stable pattern and you'd like it to do something else) simply press the button but don't hold it down. Schematic is basically the same as the Dropout Design version, except LEDs are now common cathod and a button has been added. The board layout was redone to allow using right angle headers and to make assembly a little easier. Schematic and layout files are at GitHub (CC 2.5 SA-BY) Click Download Source to grab them. Download from GitHub, released under GPL. Click Download Source to grab them. This guide was first published on Apr 12, 2013. It was last updated on Apr 12, 2013.